Sun., Oct. 28, 2018, 8:14 p.m.
It’s Organizing 101: For any social movement to expand and succeed, like-minded supporters need to connect with one another – through meetings, rallies or social media. But white nationalism isn’t just any social movement. Meetings get canceled when venue owners realize who’s renting their space. Rallies come under violent attack by organized anti-fascists. And big Silicon Valley tech companies are coming under increasing pressure to kick far-right personalities off their services. Saturday’s mass shooting by a neo-Nazi sympathizer at a Pittsburgh synagogue – which left 11 dead and is thought to be the deadliest attack on the Jewish community in American history – is likely to redouble the tough scrutiny on how the organized white nationalist movement spreads its message inside the U.S.
Much of that scrutiny is already falling on Gab, a social-media service that has served as a safe harbor for white nationalists at a time when the movement has faltered under intense internal and public pressure. The suspect in the Pittsburgh shootings, Robert Bowers, was an active user. The white nationalist movement’s most recent troubles had stemmed in large part from its controversial and deadly show of force at a rally in Charlottesville, Va., last year, where one far-right demonstrator drove his car into a crowd of anti-racism protesters, killing one. After Charlottesville, social-media companies, payment processors and service providers, bowing to public outrage, began to crack down on far-right users and startups who were using such mainstream services to post online, host websites and accept donations from fans. 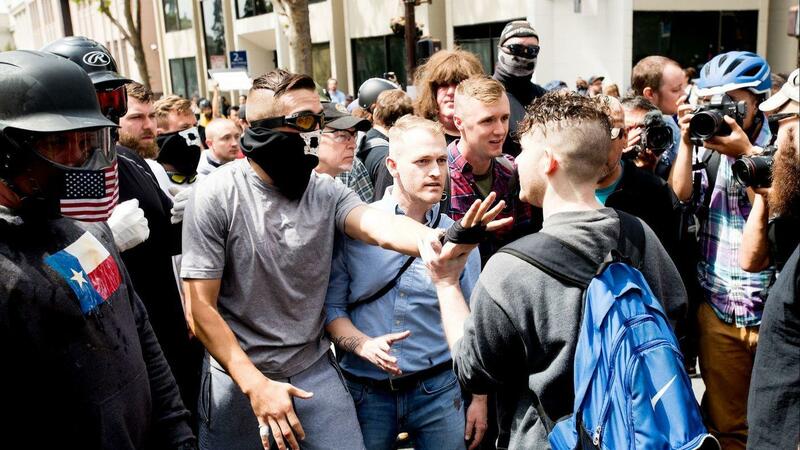 White nationalists also pointed fingers internally over who was most responsible for the event’s chaos and the negative “optics” of the rally. The movement has been further sapped by members’ arrests, fundraising problems and embarrassing media coverage of the domestic problems of key figures, including Richard Spencer of the National Policy Institute and Matthew Heimbach of the Traditionalist Worker Party. “The leadership of the organized movement is in pretty bad straits,” said Heidi Beirich, a spokeswoman for the Southern Poverty Law Center, a nonprofit organization that monitors and sometimes sues far-right groups. But one bright spot has been Gab, a Twitter-like social-media service whose logo is a green frog, which has attracted far-right users for its unwillingness to eject racist users. Bowers’ account featured neo-Nazi and anti-Semitic memes on his page, and he posted on the site about his plans moments before attacking the synagogue. Bowers was a “verified” user on Gab, which indicates he was likely a “premium” account holder who paid to gain access to special features on the site, which claims more than 700,000 users. Gab quickly removed Bowers’ profile Saturday but has declined to eject other white nationalist posters – a no-censorship stance that very much seems part of the startup’s plan from its founding in 2016 to build an anti-establishment right-wing customer base as a pathway to profitability. But the far-right users are the ones who make the company so newsworthy. Due to its willingness to accept white nationalists, “Gab, in some ways, is the largest hate site on the web,” Beirich said. One of America’s most prominent neo-Nazis, Andrew Anglin, who has been banned from multiple platforms – but not from Gab – has a similar assessment. Now, after the Pittsburgh shooting, Gab is growing similarly isolated as the payment processors Stripe and PayPal and the hosting service Joyent cut off services to the social-media company. On Sunday, the company’s Turkish chief technology officer, Ekrem Buyukkaya, announced that he was resigning from the company, citing the pressure of working for such a controversial employer. Like any startup, the troubles could pose problems for the young company’s viability if they put a dent in its budget or slow its growth. In March, Gab reported that an independent audit had expressed “substantial doubt about our ability to continue as a going concern,” though it expressed hopes more recently that those doubts had been alleviated. The company has reported collecting $1 million in crowdfunded sales of securities in 2017 and said it had hopes to collect another $5 million in another round of sales in 2018. “If we are unable to obtain sufficient amounts of capital, we may be required to reduce the scope of our planned development and operations, which could harm our business, financial condition, and operating results,” the company reported in September. Gab has been vowing, in posts on Twitter, to move forward as it battles to stay online – and to stay alive. Published: Oct. 28, 2018, 8:14 p.m.